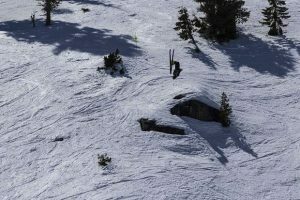 Kai Watters went 1-1 in singles pay against North Tahoe last Thursday. See this story at SierraSun.com for more on this week's area high school sports. As league standings begin to shake out, North Tahoe and Truckee have proven they’re among the best in the Nevada Interscholastic Activities Association in fall sports. From the pitch to the courts, the Wolverines and Lakers had a strong weekend, and have several teams vying for first place in their respective league. The Wolverines boys’ tennis team remained perfect on the season behind a 10-8 win against North Tahoe Sept. 13. Junior Luke Sorter led Truckee with a pair of wins in singles matches, equaling the two wins from North Tahoe senior Noah Gaffney. 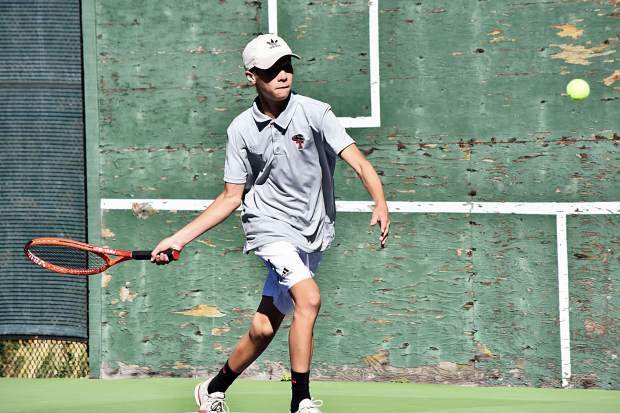 In doubles play, Truckee junior Patrick Hogan won two matches with two different teammates. Senior Zach Larson also had different teammates in his two doubles wins for Truckee. North Tahoe sophomore John Lyons and freshman Julian Cayolle teamed up to win two matches for the Lakers. Truckee (5-0 Northern League) will face fellow unbeaten South Tahoe (4-0 Northern League) on Tuesday, Sept. 18 at 3 p.m. North Tahoe (1-4 Northern League) will also play the Vikings next with a home contest on Wednesday, Sept. 19 at 3 p.m. The Truckee girls’ tennis team continued its steady play, improving to 4-1 in the Northern League with a 15-3 win against North Tahoe last Thursday. Truckee junior Rachel Heath won all three of her singles matches, and fellow junior Jasmine Posada won two. North Tahoe freshman Marina Hendricks picked up the Lakers’ only win in singles play. In doubles, senior Kira Collins and sophomore Lilah Abarno won two matches, as did sophomore Jade Bullock and freshman Maia McDermott. Truckee junior Isabella Ferrera won two matches with different partners. Truckee (4-1 Northern League) will travel to South Tahoe (4-1 Northern League) on Tuesday, Sept. 18. North Tahoe (0-5 Northern League) will be at Churchill County (2-4 Northern League) on Thursday, Sept. 20. North Tahoe’s volleyball team dropped its first Class 2A Northern League games of they year, falling 3-2 to White Pine last Saturday. The Lady Lakers opened weekend play with a 3-0 win at home against West Wendover on Friday behind nine kills from senior Sarah Shoberg. Junior Imogen Strydom was next with seven kills. Junior Skyler Kawecki led North Tahoe with 21 digs. The girls then fell to West Wendover the following day at home in team’s closest match of the season. After White Pine took the first set, 25-16, the Lakers responded by winning the next two. Unfortunately, the Bobcats took the next two sets, including a 16-14 win to take the match. North Tahoe (13-5, 3-1 Northern League) will remain at home this week for a match against Yerington (13-5, 3-0 Northern League) on Wednesday, Sept. 19 at 4 p.m. The Truckee cross-country team returned to action last weekend with the Josh Ruff Memorial Invitational at Oak Ridge High School, in Folsom. In his first race of the season, junior Montana Montgomery showed why he’s the school’s top distance runner, racing for fist place down the final stretch of the 5,000-meter boys’ varsity race against Woodcreek’s Lucas Reeves. 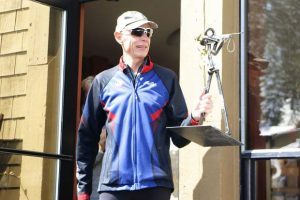 The two runners would finish 0.18 seconds apart, with Reeves capturing the overall win with a time of 16 minutes, 42.49 seconds. Truckee senior Calin Laine finished in 10th place for the team, crossing the line with a time of 17:37.21. As a team, the Truckee boys finished in fourth place against 26 other schools. On the girls’ side, sophomore Hana Mazur led Truckee with a time of 21:20.89 for 23rd place out of 150 runners. Sophomore Amelia Swanson was next for Truckee with a time 21:45.68. The Wolverines will head to Idaho this next weekend to compete in the Bob Firman Invitational. The North Tahoe cross-country team opened the season last weekend with a home meet, and picked up overall team wins on the boys and girls’ sides. At the Kiwanis Mountain Motivational Invitational last Friday, sophomores Phoenix Sanchez and Etienne Bordes finished 3.3-mile boys’ varsity race in fourth and fifth, respectively, to propel the Lakers to first overall against five other schools. Sanchez finished the race with a time of 22 minutes, 1.38 seconds, while Bordes crossed the finish line with a time of 22:06.66. Junior Nickolas Burkhart gave the Lakers another runner in the top 10, finishing with a time of 22:35.22 for seventh place. Sierra Lutheran senior Jared Marchegger won the race with a time of 20:46.25. On the girls’ side, sophomore Kili Lehmkuhl took second place with a time of 26:53.12, while Lowry senior Rebecca Kuskie won the race with a time of 25:32.78. 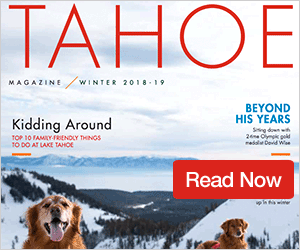 North Tahoe won the meet behind three more finishers in the top eight. Seniors Jillian Ferre (27:43.03) was sixth, Ella Carr (28:33.06) was seventh, and Josii Johnson (28:43.03) was eighth. The Lakers will next travel to the Yuba-Sutter Invite on Friday, Sept. 21. The Truckee boys’ soccer team pushed its winning streak to five games after picking up a pair of home victories last weekend. 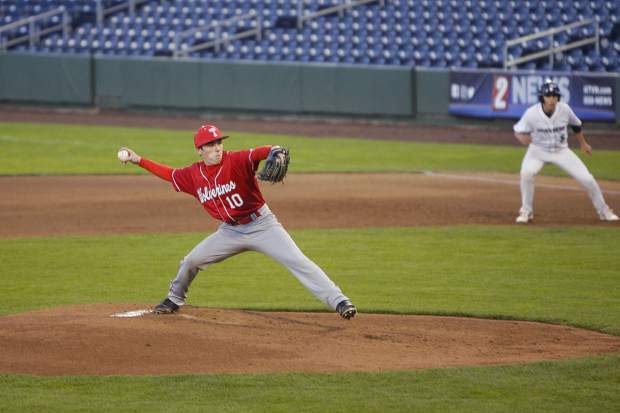 The Wolverines played Churchill County on Friday, Sept. 14, and cruised to a 9-1 victory. The team then hosted league opponent, Lowry, the following day, and earned a 4-2 win. The two goals allowed are the most since Truckee’s loss to North Valleys to close August. The Wolverines (5-3-1, 5-1 Northern League) will be at North Tahoe (4-3, 1-2 Northern League) on Friday, Sept. 21, at 6 p.m.
After a rough start to open Northern League play, the North Tahoe boys’ soccer team rolled to a pair of wins last weekend, taking out Lowry and Churchill Country by a combined score of 14-2. The Lakers (4-3, 3-2 Northern League) will be at Incline (0-6 Northern League) on Tuesday, Sept. 18, at 6 p.m. The team will then host Truckee on Friday at 6 p.m. The Truckee girls’ soccer team remained undefeated in Northern League play, capping off a four-game road stint last weekend with a pair of wins dominant wins over Churchill County and Lowry. The girls haven’t had a home game since Sept. 4, but during that time have topped opponents by a combined total of 26-1, including shutouts in the team’s last three outings. Truckee took an 11-0 win against Churchill County last Friday in a game that saw nine different scorers for the Wolverines. Senior Amber Simonpietri and junior Alondra Villa each scored two goals. Freshman keeper Jessica Kaufman picked up the shutout and recorder a pair of saves. Truckee then took on Lowry the following day, and took a 4-0 win over the Buckaroos. Simonpietri again found the back of the net. Truckee also had goals from junior Emily Monson, and sophomores Sophia Sullivan and Carly Davis. Kaufmann served as the team’s keeper, recording one save. Truckee (6-2, 6-0 Northern League) will next face rivals North Tahoe (5-2, 5-0 Northern League) at home on Saturday, Sept. 22, at noon. North Tahoe’s soccer team improved to 5-0 in Northern League play, taking a pair of wins against Lowry and Churchill County last weekend. The girls have yet to allow a goal through five league contests thus far, and will next face off at Incline (4-2 Northern League) on Tuesday, Sept. 18, at 4 p.m.
North Tahoe (5-2, 5-0 Northern League) will then face league leaders, Truckee on the road at noon on Saturday.